YAY! Remember how I keep talking to you about storybook style paintings? Well, I finally got one of the most popular ones captured and I now have prints of it available to you and to everyone! This was a gift to my wonderful friend, Rebecca, years ago. It’s back before I used a standard paper size or before I even made sure to have right angles. 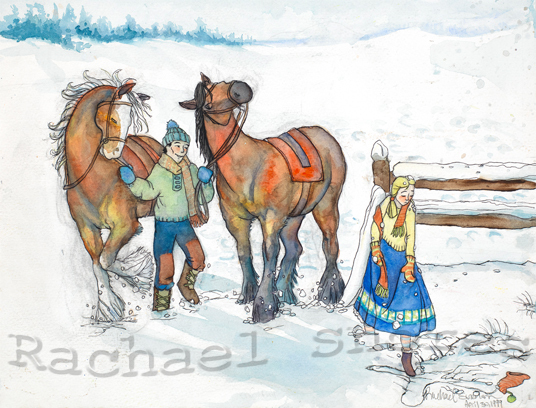 These are my Uncle’s horses, Ike and Barney and the story of this is Allen and Lin are out for a ride in fresh snowfall. As avid a rider as Lin is she got herself tossed when she tried to jump Barney over the fence. Barney is not a jumping horse, he’s pretty much a plow horse. Since we missed seeing exactly what happened I would say that Barney simply stopped at the fence and Lin continued over on her own. Now she tries to brush of her embarrassment and maintain her dignity. Allen is as sweet and dignified as they come, you can see him practicing a concerned smile. I hope you love this painting. It’s an oldy but goody. I finally got to visit Rebecca and when I left I brought her painting with me. It is now safely back at her house where it will stay but now anyone can own a print. 11×14 prints are for sale on Etsy or at Zapow. You’ll have to send a request to Zapow. Please contact me with any questions or if you have trouble finding it for sale.